Card Database - All of the cards on-line with filters. Free M2E Rulebook - Download the rules. Breaching the Emerald City - Facebook Group dedicated to Malifaux and TOS in the greater Seattle region. Edmonds/Everett Area Malifaux - Wyrd Forum post about the events I run in the area. Mugu Games - Everett game store with limited Malifaux stock where I run events. Wyrd's Malifaux App - Crew creator, game tracker, etc. With an upgrade it includes model stat cards. By The Hanging Tree - Crew Creator. Marker Generator - On-line tool to design and print your own markers. Master Timing Chart - A breakdown of much of the timing in the game. Organized Play Format Docs - Tournament, league and alternate format rule download. Play Testing Application - Apply to beta test Wyrd games. Pod Casts, Forums, Blogs, Etc. Wyrd Place - General discussion Facebook Group. Schemes and Stones Pod Cast - This pod cast is focused on tactics. Most pod cast feature a single master. Very well done. Red Jokers - A facebook Group and pod cast by a group of Australians with master reviews, but primarily an irreverent, ad hoc Malifaux discussion. Breachside Broadcast - Wyrd's Pod Cast. Basically audio version of the fluff in the books. 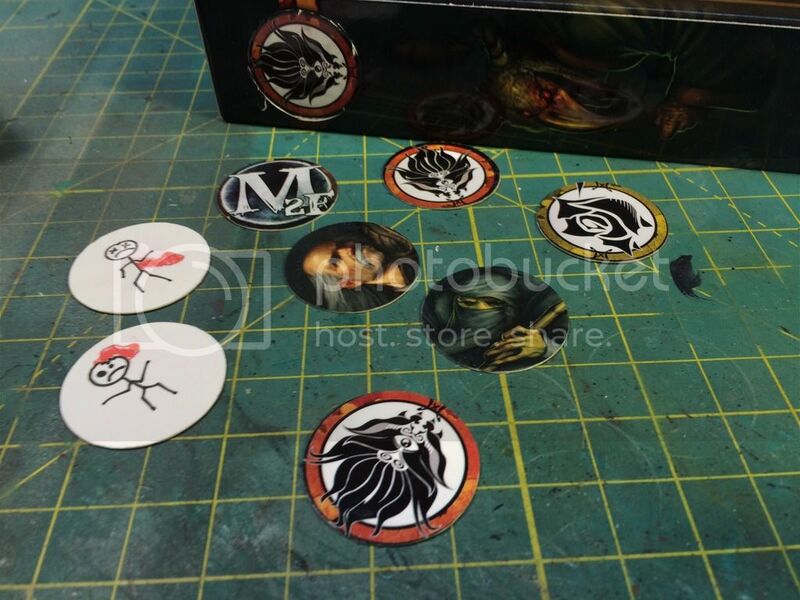 Do-It-Yourself Markers - The faction symbols on the Malifaux boxes are the perfect size for markers. Use a 30mm base as a guide and cut out the faction symbol for scheme markers. Run a light bead of super glue along the edge for strength. Flip them over for corps or scrap markers. Story Encounter Index - Forum post listing Malifaux Story Encounters. 12 Names for 13 Tyrants - Great Post about the Tyrants. Character Background Index - Where to find all the fluff on your favorite models. Character Background Order - Order to read background stories. Upcomming - Upcoming releases on the Wyrd site. Webstore - Wyrd's official store, but please support your FLGS if you can. DriveThruRpg - Wyrd rulebooks in PDF format. The small rulebook and Chronicles e-zine is free. OffWorld Designs - Wyrd T-shirts. Wargame Vault - Get individual stat cards and GG2016 Scheme and Strategy deck here. Mats By Mars - Play mats with deployment areas, center lines, etc. marked. Laser cut wood terrain as well. Widget Wizards - Markers, range rulers at good prices. They have x-wing templates as well. This is the place I went. Things Undone - Markers, base inserts, etc. Chimeric Designs - Markers, etc. Angry Mojo Games - Markers, range rulers, terrain, etc. Customeeple - Markers, terrain, etc. Tablewar - High end army transport cases. Frikead - Stickers to cover bases for those of you who don't like to paint. Building On A Budget - The goal is to help players start a new faction and quickly build tournament viable lists on a budget. They only had guild lists up last time I checked. Dave Graffam Models - Paper models for those on a budget. Free sample items. Matts By Mars - Laser cut wood terrain. Play mats with deployment areas, center lines, etc. marked as well. Stonehouse Miniatures - Medieval building and walls. Breaching the Faux - Northwest Annual (April-ish) Malifaux Tournament. Ascension - A 5-week curated Shifting Loyalties narrative campaign. Some of these items may be in the henchman only forums. Ratty Terrain - Ratty gives some advice on the "proper" way to set up terrain. Demo Advice - Some tips on running a demo. Must be a henchman to access. Common TO Ruling Document - A community FAQ created by Henchman to aid Tournament Organizers in making constant rulings across events. Certificates - Certificates that can be handed out to players.